According to the data from the World Bank, world population in the year was nearly 7.347 billion and it will increase to 8.5 billion by 2030. This growth of population puts tremendous pressure on the food and agriculture industry to provide healthy and sustainable food products to this growing population. In the recent years, due to the increase in disposable income among the people of the developing countries, where the population growth rate is maximum, there is a trend of increasing demand for meat products. With decreasing farm space and pressure on the farm producers to maximize their products, feed additives are a sustainable way to increase the efficiency of the farm output. Additives have been used as growth promoters in animals since World War 2. With time, usage of many of the antibiotics gained focus and after that had a declining trend due to its effect on the environment after use. Due to industrialization these feed additives are made available to the producers at a very affordable cost which makes the additives a favorable option for them. As people are more concerned about the chemicals in their food, feed additive market moved towards more natural ways of growth promoters in animals such as prebiotic and probiotic. There are many players in the market but top 10 industries hold most of the market share. These company have a huge research and development expenditure to meet the growing demand of the growing population. These players operate across the globe and have their unique USP’s to provide value to the end users. Major feed additives prevailing in the market are Vitamin, Antibiotics, Enzymes, Antioxidants, Amino Acids, Minerals, Prebiotic and Probiotic. The major animal types being used in the report are ruminants, poultry and swine. The major geographical regions considered in this report are North America, Latin and South America, Middle East and Africa, Europe and Asia Pacific. All of the above mentioned categories have been thoroughly analyzed in this report. Additives are the next big things in the animal feed market due to their efficiency, productivity as well as due to their profit generating capacity. The future market has a great scope for this market. •This report provides a detailed view of global feed additive market with current demand and the forecasted demand for the market. •This report identifies the need for focusing on the usage of feed additives for the farm animals. •This report also provides a historical perspective of the usage and growth of feed additives as a growth promoter by farm house producers. 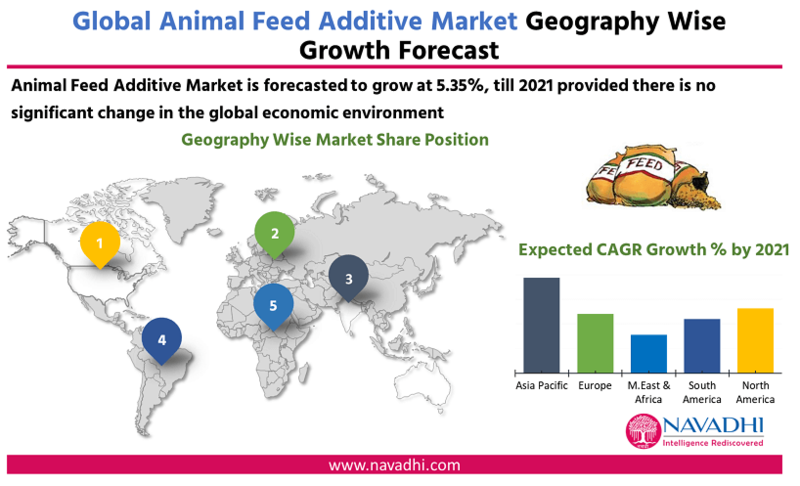 •This report provides detailed information on global feed additive market with growth forecasts up to 2022. •This report also focuses on developing a better understanding of the current trends of the feed additive market. •This study also identifies various policies related to feed additive market and distribution across various countries in the world market. 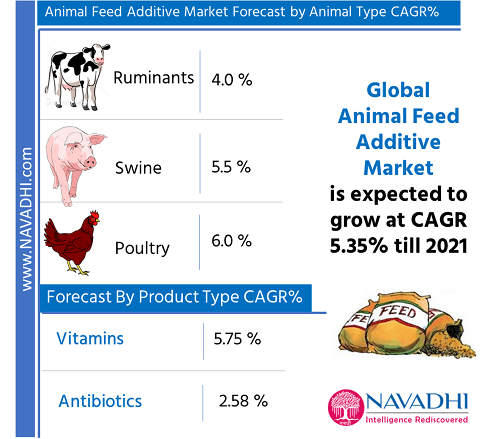 •The report identifies the growth drivers and inhibitors for the global animal feed additive market. •This report profiles ten manufacturers related to feed additive market. •This report provides detailed competitive landscape of the global feed additive market. •This report also provides information regarding the global industries associations related to this industry. •This report identifies major challenges faced by a new player in global feed additive market. •The report identifies the key risks associated with the feed additive market. •This report provides future trends for global feed additive market.